Pizza base topped with tomato sauce, mozzarella medium fat soft cheese and Cheddar cheese. Wheat Flour (Wheat Flour, Calcium Carbonate, Iron, Niacin, Thiamin), Water, Mozzarella Medium Fat Soft Cheese (Milk) (15%), Tomato Purée, Cheddar Cheese (Milk) (5%), Rapeseed Oil, Yeast, Cornflour, Sugar, Salt, Semolina (Wheat), Parsley, Basil, Oregano, Garlic Powder, Chilli Powder, Onion Powder, Cayenne Pepper, Soya Flour, Whey Powder (Milk), Flour Treatment Agent (Ascorbic Acid). Remove all packaging including plastic tray. Check food is piping hot throughout and the cheese is bubbling before serving. From Chilled: 200 °C / Fan 180 °C / Gas 6 8 - 10 mins Place pizza directly onto the top shelf of a preheated oven for 8-10 minutes. 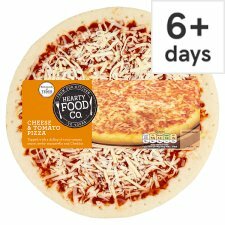 From Frozen: 200 °C / Fan 180 °C / Gas 6 10 - 12 mins Place pizza directly onto the top shelf of a preheated oven for 10 - 12 minutes.